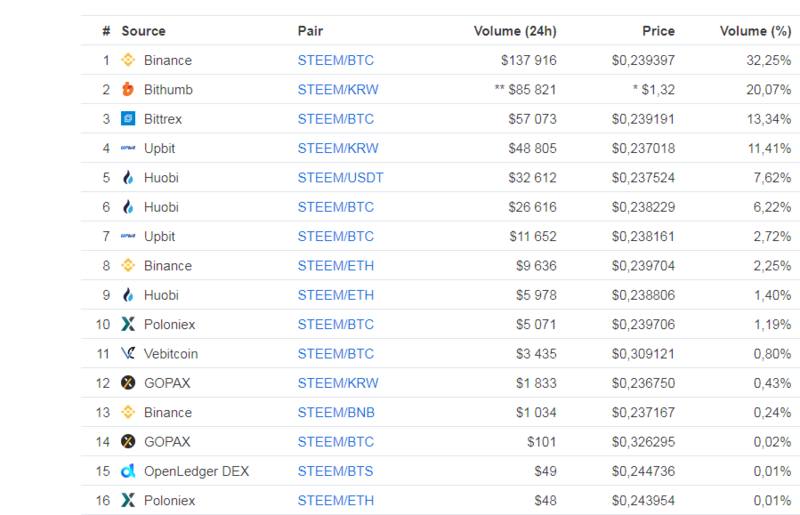 All people know of BTC/ETH or even USD/KRW pairs for STEEM or SBD. Yet on OpenLedger (decentralized, build on BTS) there is loads of pairs you may never used. So you can buy and sell STEEM there for other coins without BTC or ETH in the middle. You can also exchange STEEM/SBD with @blocktrades without an account to a few things on the fly, still good to have BTS account though (as they use ie bitEUR or bitUSD). Edit: Native price plugin uses iframe so wont work here, just click above. Once you got pass the UI difficulty of OpenLedger. It gets really fun using the DEX. There is only the problem of illiquidity. But I suspect that's a great way to arb for the experts! Yes that has to be one of the most user un-friendly UI. Hope the improvement keep coming. Also find that trying to use on small (mobile) screen is nightmare. I don't think they are working on that anytime soon. And so it seems that only the most technical users can take advantage of the arbitrage opportunity on the platform. The UI isn't THAT bad. It's definitely improved over the last year. Lemme know how you felt about it! I'll prolly go check it myself too. You'll get used to it. 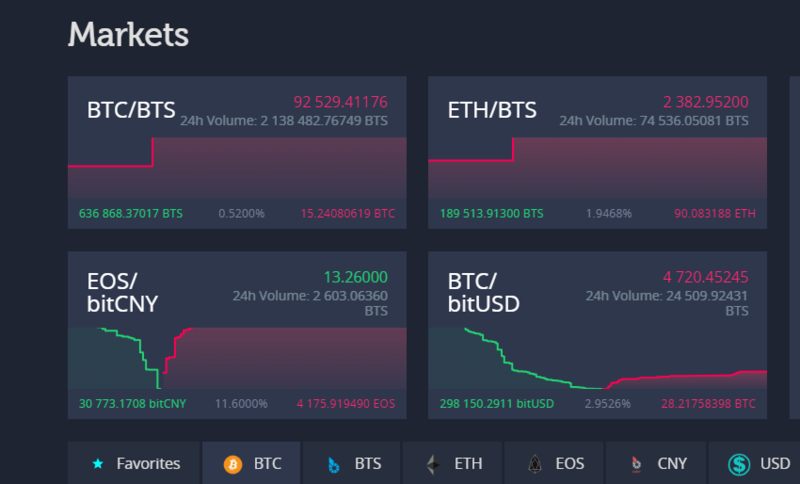 Don't forget, you can use other bitshares interfaces too like the bitshares exchange, crypto-bridge, and gdex. They all have slightly different looks. Some have some different coins too, especially crypto-bridge. Perhaps you're right.. The last time I've checked and given up on the UI has got to be half a year ago. yeah, it's changed a bit since then. like i said in my other comment, there's other bitshares interfaces you can try out too. So Open Ledger finally enabled the deposit/withrawal of STEEM, it only took them like...forever. Thanks for promoting Open Ledger...The pro'lem must be on my end; because I have had an initialization error message for weeks...I don't even think I can submit a ticket. Many thanks...I will take a look at a new approach/exchange in the new year...Perhaps, by then OL will have corrected itself...There are zero access points currently, so...just thanking God that it's not a system that I rely on to any degree....hobby mode per se...and continued prayers for those who do. Why do you use openledger and not Bitshares directly? Interesting! Thanks for the heads up! I love lazy people mode on @blocktrades! so many exchanges that i am not aware of. i feel so lacking still in crypto. Yup, DEX can save day, sometimes. Subscribe: automatically support your favourite steem authors :) | For investors. i like to use BTS. Instant transfer + Zero transfer fees + Price stablisation system are features of platform was developed by CEO Ken ZENG and THANH DAO CTO. There is always something new to learn about Steem. Thanks for sharing this. I've not used OpenLedger personally, but I'm glad it is an option. About 67.71$ has been spent to promote this content. @steemium purchased a 44.97% vote from @promobot on this post. You got a 28.62% upvote from @brupvoter courtesy of @steemium! This post has received a 39.88 % upvote from @boomerang. Your UA account score is currently 7.292 which ranks you at #63 across all Steem accounts. In our last Algorithmic Curation Round, consisting of 368 contributions, your post is ranked at #7.
grow strong to increase the property. My choice is #Nexty. Join @Nextyio is more. You got a 53.40% upvote from @joeparys! Thank you for your support of our services. To continue your support, please follow and delegate Steem power to @joeparys for daily steem and steem dollar payouts! Join Telegram group https://t.me/coinnessofficial to win 100,000USDT & claim your 200CNNS rewards: CoinNess - Real-time crypto news & market chosen by 3M crypto users. You got a 27.78% upvote from @booster courtesy of @steemium! How To Double Your Bitcoins? https://instant-bitcoin.org/?ref=%5B1Mig7brep3ZNPwRLJtDSAdwfmieFimHACw%5D is a fully automated bitcoin doubler program operating with no human intervention. Take advantage of the power of our high-frequency trading platform. Using machine learning to study and predict the bitcoin price, our servers open and close thousands of transactions per second, locking in the price difference and transaction fees as profit. It's really simple to participate in our affiliate program. Share your referral link, Who ever invests through your link will gets Payout In 30 Minutes. You will receive 50% of your friends investment who invests Minimum: 0.001 BTC. I see this week BTC fell more than 3k$, the market crypto down very strong. #Nexty is still stable with unchanged prices.